It is only a few weeks away and I am really excited about the conference again this year. I have been so busy with my bookkeeping business that I have had little opportunity to 'play' with the thread and cloth and paint that is in my tiny studio space. A friend is coming with me this year so the eight hour drive will seem much shorter and we can catch up on gabbing while en route. I am looking forward to renewing time with friends, teachers and students and looking forward to new students in my classes this year. I have been knitting teensy items for friends and family who have been madly producing babies this year. These knitted things are tiny so keep my interest and use up bits of yarn that have been around for a while. 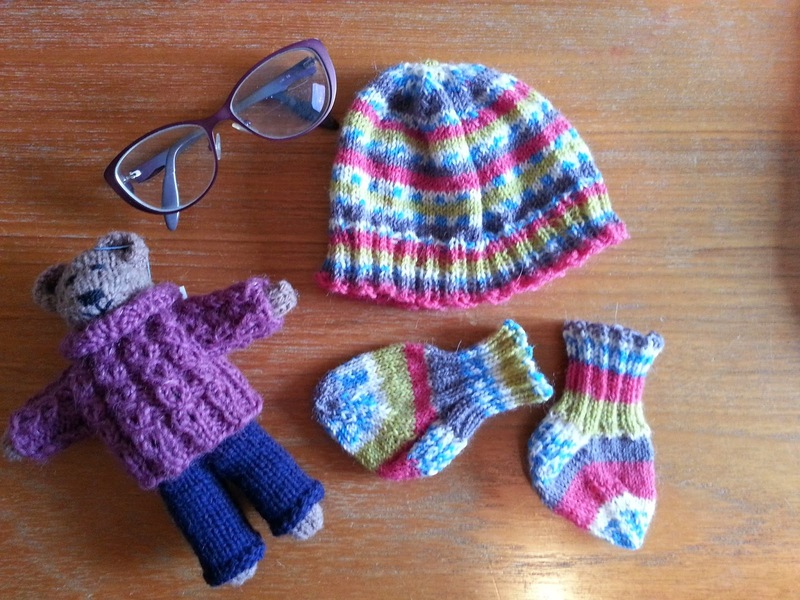 I knitted the wee hat and socks for Kaeley, daughter of a young man who has been like another member of our family and grew up next door to us. Can't believe he is a dad. 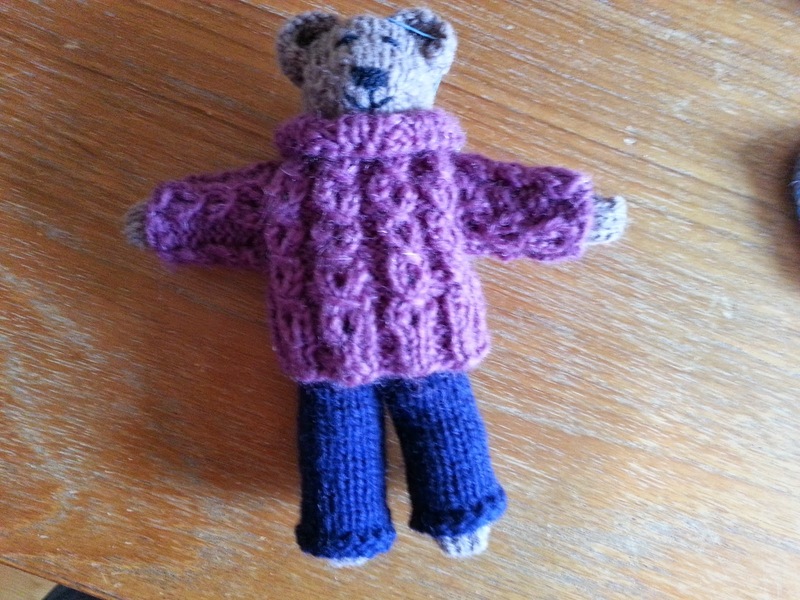 The bear was knitted from handspun yarn by a friend of mine from the Edmonton Weavers Guild. 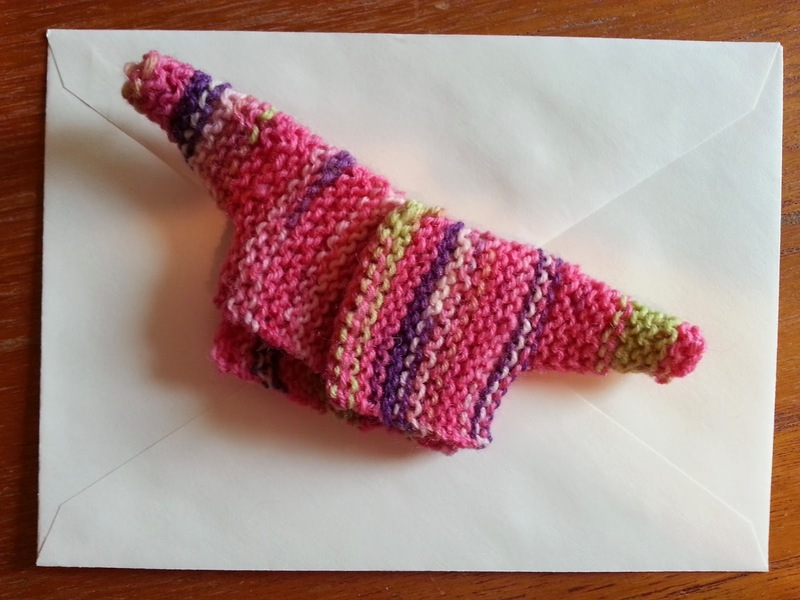 The teensy sweater does fit on a card and is for the above noted wee princess. I am busy now working on another embroidery project that will likely be another 10 year project. 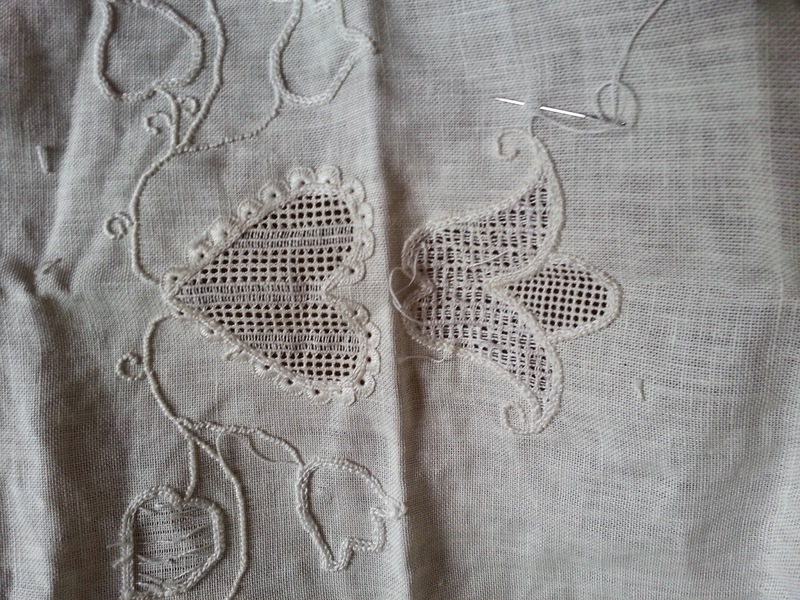 Schwalm embroidery is a Germanic whitework of pulled and drawn threads. I found it in Anna magazine years ago the took a class at the Old Retreat that is sponsored each year by the Edmonton Needlecraft guild and Calgary Guild of NeedleArts. Won't that instructor laugh when she sees this on the go...I think the year I took this class was 1995 or so! I am giggling about the UFO's that I am working away at now. It is fun to do new projects but delightful to go back to look at what I was interested in years ago. I have added Marci Baker's blog to my blog list. Marci is an amazing quilt maker and business owner from Colorado. Marci's company is Alicia's Attic. Have a look at her website and blog. She has written and published a number of quilting books that you will want to have. I am fortunate to see Marci in two weeks at the Saskatchewan Stitches conference. Have a look at that on the web as well. You might want to come to it next week. There are now about 250 participants over ten days. Tiny Humboldt Saskatchwan and St. Peters Monastery are over run with sewing enthusiasts for that time. I think they love us.